Galway claimed a crucial victory away to Monaghan, played out in freezing conditions at Inniskeen. Galway were very defensive in the opening half, but Monaghan made some very basic mistakes and it cost them at full time. This will be huge kick in the teeth for Malachy O’Rourke’s side who looked to be in a great position after defeating Dublin in the first round, but they have suffered two successive defeats since then. Jack McCarron opened the scoring with a free off his left foot in the third minute to give his side the early advantage. Galway opted to flood the defence, bringing almost every player behind the ball, which led to limited scoring opportunities for both teams. 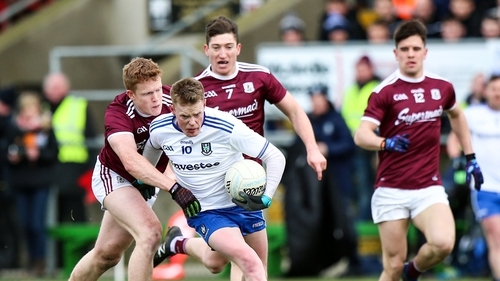 Monaghan stretched their advantage to three points after further place ball efforts from Conor McManus and Jack McCarron, as Galway failed to register a score in the opening 20 minutes of the match. It was Jonathan Duane who finally opened his side's account with a neat effort, but there would not be another score until the 28th minute, much to the frustration of those in attendance. It was Vinny Corey who registered his side's fourth score with a well-taken point but it was all Galway from this juncture. Galway: Ruairi Lavelle; Eoghan Kerin, Sean Kelly, David Wynne; Gary O’Donnell, Gareth Bradshaw, John Daly; Thomas Flynn, Kieran Duggan; Johnny Heaney (1-00), Jonathan Duane (0-01), Peter Cooke; Antoine O Laoi (0-01), Padraig Cunningham (0-01), Shane Walsh (0-05, 3f). Subs: Danny Cummins for Cunningham (58), Michael Daly (0-01) for Cooke (58) Barry McHugh for Duane (60), Cein Darcy for O Laoi (70). Monaghan: Rory Beggan (0-02, 2f); Kieran Duffy, Drew Wylie, Ryan Wylie; Vinny Corey (0-01), Barry Kerr, Colin Walshe; Darren Hughes (0-02), Fintan Kelly; Ryan McAnespie, Jack McCarron (0-02, 1f), Shane Carey; Dermot Malone, Dessie Ward, Conor McManus (0-04, 3f). Subs: Neil McAdam for Kelly (8), Conor McCarthy for McCarron (41), Dessie Mone for McAdam (53), Owen Duffy for McAnespie (58), David Garland for K Duffy (61).